Which mature tech giant has a better shot at rallying in 2019? Check out the latest Western Digital and Texas Instruments earnings call transcripts. Western Digital (NASDAQ:WDC) and Texas Instruments (NASDAQ:TXN) didn't impress investors in 2018. WD's stock tumbled more than 50% as its HDD (hard disk drive) shipments decelerated and declining memory prices torpedoed its SSD (solid-state drive) and flash memory units. TI's stock fell 10% as softer demand for its embedded chips across multiple industries throttled its growth. Let's take a closer look at both companies to see if either stock can rebound in 2019. WD is the largest maker of traditional platter-based HDDs in the world. Its acquisition of SanDisk in 2016 also made it one of the top makers of NAND (flash) memory chips and SSDs. WD acquired SanDisk because SSDs -- which are faster, smaller, more power efficient, and less prone to damage than HDDs -- represent a disruptive threat to its legacy business. Half of its revenue came from HDD sales last quarter, while the other half came from sales of flash products. WD's business is split into three core units: Client Devices, which includes HDDs and SSDs for PCs and consumer electronics, embedded storage devices, and wafer sales; Client Solutions, which sells branded HDDs and flash products; and Data Center Devices and Solutions, which sells HDDs, SSDs, and software to enterprise customers. It also collects licensing fees and royalties from all three units. The Client Devices unit generated over half of WD's revenues last quarter. Texas Instruments breaks down its business into three core units: analog, embedded, and other chips. Analog chips accounted for 68% of TI's revenues last quarter, 21% came from embedded chips, and the remaining 11% came from its other chips. TI sells those chips to a wide range of industries, but most of its growth in recent quarters came from the industrial and automotive markets. Factories are installing more of TI's embedded chips in their industrial machines, and automakers are integrating more of its chips into connected and driverless cars. TXN and WDC Gross Profit Margin (TTM) data by YCharts. How fast are WD and Texas Instruments growing? WD's revenue and earnings growth decelerated sharply over the past year as demand for HDDs dried up in its core data center, client computing, and non-computing markets. That pain, which indicates that enterprise spending is slowing down, was exacerbated by tumbling NAND prices, which fell as the market faced an oversupply of chips. Texas Instruments' numbers look healthier, but its growth also decelerated throughout fiscal 2018. Source: TI quarterly reports. *Due to accounting standard change. TI's revenue growth during the third quarter narrowly missed Wall Street's expectations for the first time in nearly three years. It blamed that shortfall on weaker demand for its embedded chips (down 4% annually), which was interpreted as a sign of weakness for the entire semiconductor market and the key industrial and auto markets. Both WD and TI are expected to face tougher near-term challenges. Analysts expect WD's revenue and earnings to fall 20% and 62%, respectively, and decline at even steeper rates in the third quarter. 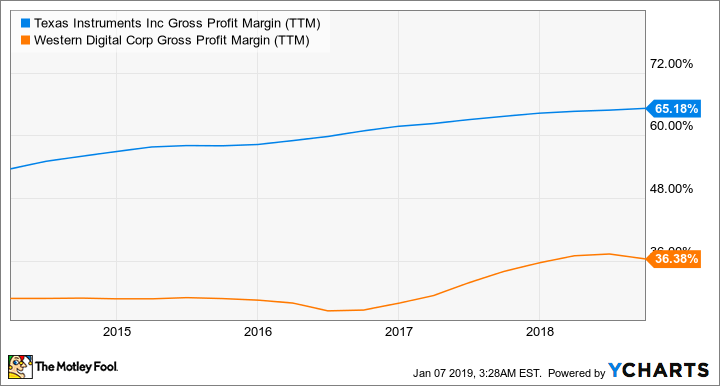 TI is expected to post flat sales growth and just 14% earnings growth for the fourth quarter, followed by negative sales and earnings growth in the first quarter of 2019. Neither WD nor TI looks like a compelling investment based on those forecasts. However, WD faces tougher cyclical headwinds in the NAND market for the foreseeable future, while TI has a better diversified business that isn't heavily exposed to a single cyclical headwind. Therefore any progress in trade talks with China or better-than-expected numbers from industrial companies or automakers could boost TI's outlook. WD trades at just 5 times forward earnings and pays a forward dividend yield of 5.4%. TI trades at 17 times forward earnings and pays a lower forward yield of 3.3%. Based on those numbers, WD might seem like an undervalued income stock, but it's cheap for a lot of reasons. TI isn't necessarily cheap relative to its short-term growth, but it will likely rebound faster than WD if the market recovers. I wouldn't rush to buy either stock yet, but TI's better diversified business, low exposure to single cyclical markets, and higher margins make it a much safer stock than WD, which probably won't recover until NAND prices start climbing again.